Machined one piece design for extreme accuracy. No moving parts between firearm and scope. Lightweight. Approximately a third of the weight of steel. Fast installation and requires no special tools. Eliminates need for windage screws. Perfect ring alignment. No lapping required. 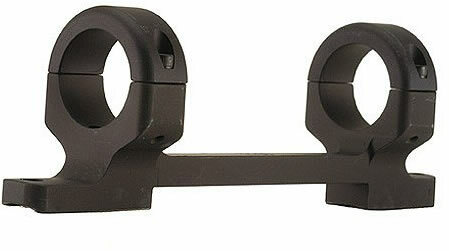 Eliminates or reduces scope damage from tightening rings. Ring placement allows extra eye relief adjustment. Up to 4 times more thread length in rings....full 1/2 inch. Made of billet aluminum. Tempered 6061T6. Grade 8 hardened steel screws.